We report an infectious cDNA clone of ZIKV that was generated using a clinical isolate of the Asian lineage. The cDNA clone-derived RNA is infectious in cells, generating recombinant ZIKV. The recombinant virus is virulent in established ZIKV mouse models, leading to neurological signs relevant to human disease. Additionally, recombinant ZIKV is infectious for Aedes aegypti and thus provides a means to examine virus transmission. The infectious cDNA clone was further used to generate a luciferase ZIKV that exhibited sensitivity to a panflavivirus inhibitor, highlighting its potential utility for antiviral screening. 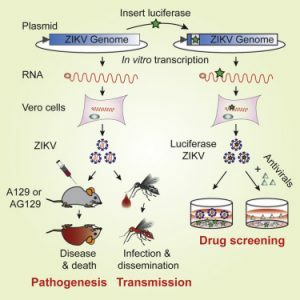 This ZIKV reverse genetic system, together with mouse and mosquito infection models, may help identify viral determinants of human virulence and mosquito transmission as well as inform vaccine and therapeutic strategies.